Like clockwork, when the weather changes over the last couple of years, I have gotten a bad (and I mean really bad) sinus cold that puts me down for several days, weeks, even getting into the months category. Well, my students were sick this past week and I felt something coming on, so I tried a new tactic: the vitamin and herb therapy promoted by the orthomolecular therapy guys, brought to my home via Airborne tablets. So the report? Well, its been keeping the cold at bay at least, though my head is getting a little congested. It will not keep us from our fun plans for the evening however! What are they you ask? Well, yesterday was 7 months for us, and we are getting in the habit of celebrating every month. The Catholic church down the road has a massive fall festival going, complete with rides, junk food, and cheap stuffed toys to win. Sounds like fun to me! If we get good pics I will be sure to post. 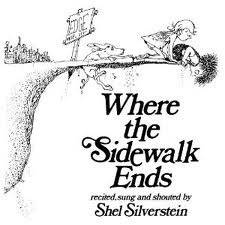 But here is what I'd like to leave you with today, one of my favorite Shel Silverstein poems, that I dug out to read to my boys this week, in hopes of keeping them smiling as they fought off the sniffles. I hope you enjoy it!